Whenever I want to video chat with someone I can send them that link in an email or post it on my blog. The link never changes. 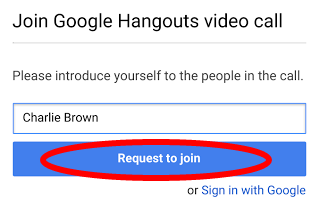 Google Hangouts Now Open to Everyone! As of today Google has made it much easier to Hangout with just about anyone, even if that person does not have a Google or Gmail account! When you share the hangout link with someone that does not have a Gmail account or whom may not be signed into Google, they are presented with a pop up menu asking them to introduce themselves. That person only needs to type in their name and click Request to join. Once you accept the invite you can begin the video conference. Simple and hassle free. Boom! Install the Google Hangout Apps & Extension!